I needed a quick gift project and was looking for an excuse to use some nice yarn, so this what I came up with. In a moment of weakness while at Article Pract the other day, I bought 2 skeins of Manos del Uruguay. I figured it was acceptable because I need to get started ASAP on my Christmas projects. I decided that it will be a scarf and got started right away. 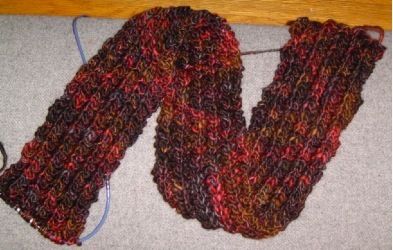 Since two skeins isn’t really that much, the plan was to keep the scarf skinny and long. I found the stitch pattern in the Second Treasury of Knitting Patterns. K2, P2 for the whole row and end K2 P1. It makes a gentle rib that doesn’t bunch up too tightly. It Is half done already! Edit: Finished size is 84 inches. 2 Responses to "Quick Manos scarf"
Ooooo! Thanks for the idea! I have some nice Manos, and had no ideas what to do with it. Thanks!